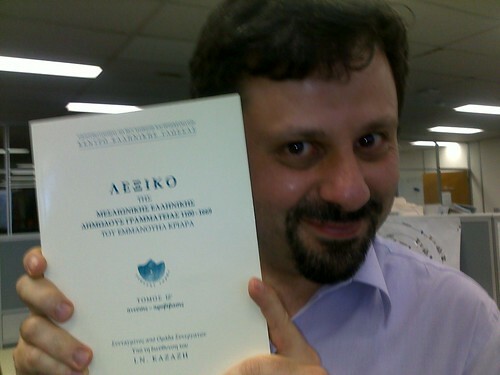 New volumes of Kriaras' and Trapp's dictionaries of Greek are out. Kriaras covers Vernacular Early Modern Greek, and Trapp covers (mostly learnèd) Late Mediaeval Greek, with some overlap. For background on these dictionaries—and on the coverages of the dictionaries of Greek in general—see my earlier post on Dictionary coverage of Greek. Trapp's Dictionary, Fascicle 7 of 8, runs from right after προσπελαγίζω to the end of sigma. Currently it is available only in electronic form, from the Austrian Academy of Sciences Press; a print edition is expected in a month or so. As the linked blurb notes, Trapp has not ruled vernacular texts out of scope (and is more inclusive of non-literary texts than Kriaras); it is addressing the delay in the completion of Kriaras by using already published word lists of Early Modern Greek, to give indicative coverage. Trapp is also including words from later papyri; while its brief is ostensively late mediaeval, it does look backwards as well, given the gaps in lexicography. Kriaras' Dictionary, Vol. 17 of an expected (20?) covers πνεύσις through προβίβασις. The volume is already available in online bookstores—I've just ordered it from Patakis. The announcement linked from the Greek Language Gateway (Πύλη για την ελληνική γλώσσα) notes that the volume will be made available online by them as well, as part of Emmanuel Kriaras' Collected Works. Vol 17 isn't up, but the others are, as scans (in the kind of page-by-page interface that makes me relieved to have paper copies :-) ). The abridged dictionary, covering the first 14 volumes, is also online in a searchable interface, through the Electronic Node (Ηλεκτρονικός Κόμβος) site—both from the Centre for the Greek Language. Πολύ ενδιαφέρον θα έλεγα. Στη συνέχεια του άρθρου , θέλω να επισημάνω ότι είναι εφικτό κάποιος να είναι σε θέση να χρησιμοποιήσει on line εργαλεία για τον ίδιο σκοπό. Ένα παράδειγμα είναι και αυτό το site που κάνει metafrasi λέξεων ή ολόκληρον κειμένων ανάμεσα σε 35 γλώσσες . Το επισημαίνω γιατί μπορεί να ενδιαφέρει κάποιον .